This son of popular ABS sire, Shear Force, is a fantastic prospect. He is very structurally correct, extra deep bodied and thick with an eye appealing pattern. Shear Force 559 is in the top 10% for CED, top 5% for YW, top 15% for WW, top 20% IMF, top 15% REA and top 10% $B. 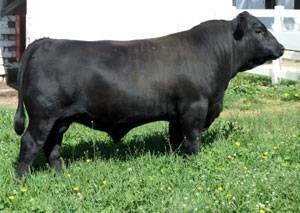 There aren't too many calving ease sires available who match his EPDs. His dam is a very productive and soggy T510 daughter. We like his pedigree, which can be used on many of today's most popular bloodlines as an outcross. Shear Force 559 is 5 Star Genestar bull, with 4 stars for tenderness.